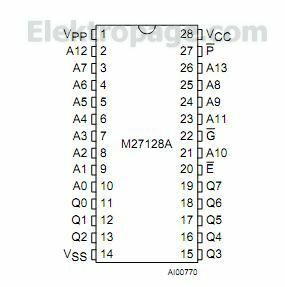 The M27128A is a 131,072 bit UV erasable and electrically programmable memory EPROM. It is organized as 16,384 words by 8 bits. 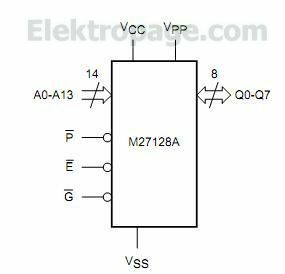 The M27128A is housed in a 28 Pin Window Ceramic Frit-Seal Dual-in-Line package. The transparent lid allows the user to expose the chip to ultraviolet light to erase the bit pattern. A new pattern can then be written to the device by following the programming procedure.